Martin Ragginger cruised to victory in the opening race of the weekend for Porsche Carrera Cup Asia at the Red Rooster Sydney SuperNight 300. 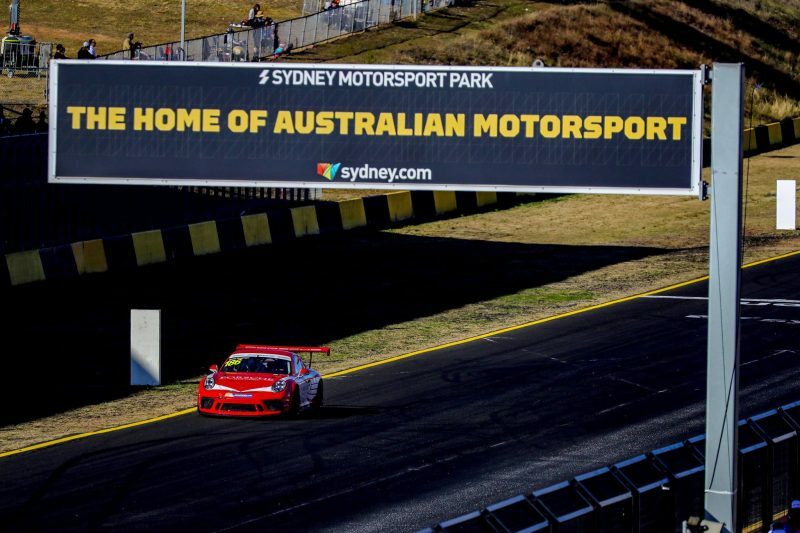 The Austrian racer led from lights to flag after starting the 16 lap encounter, which forms Round 6 of the series, at Sydney Motorsport Park from pole position. Chris van der Drift was forced to start from seventh following a two-place grid penalty for the team working on the car in the fast lane during qualifying. Van der Drift, however, charged back through the field to cross the line second after muscling his way past Philip Hamprecht on Lap 11, with the latter finishing third. Will Bamber joined Ragginger on the front row of the grid, but the former’s race didn’t get much further than the first lap, after the New Zealander struggled to launch off the line and bogged down. Bamber was swallowed up by the field, immediately dropping outside the top 10 before pulling off the track at Turn 4 with a damaged clutch. As van der Drift made his way up the order, Ragginger began to stretch his lead out front, to the tune of six seconds by the time van der Drift elbowed past Hamprecht. The Kiwi then set his sights on the race leader after clearing Hamprecht, but only managed to close the gap to four seconds at the flag. Tanart Sathienthirakul finished up fourth after moving into the position during the mid-stages of the race, while Yuan Bo completed the top five. Pro-Am class honours came down to the last lap, as second place Francis Tjia ran wide at the final corner complex while trying to mount a challenge on the class leader. Tjia made contact with third place man Ahmad F. Alam who ended up facing the wrong way. This left Bao Jinlong to grab the Pro-Am class win ahead of Tjia and beneficiary from the incident, Wayne Shen. Meanwhile, just behind, Li Chao dropped a wheel off on the grass on the exit of the final turn, spinning towards the inside of the circuit but narrowly avoiding the concrete wall. Chinese driver Cui Yue brought home a sixth place finish just in front of Maxime Jousse, while the top 10 was rounded out by Daniel Lu Wenlong and the Pro-Am class duo of, Bao and Tija. Ragginger will once again start Race 2 from pole position after his second fastest lap in qualifying was also good enough to secure the top spot. Porsche Carrera Cup Asia will have another race, which is scheduled for 1405 AEST, before the two Carrera Cup Australia/Asia joint races later in the day.